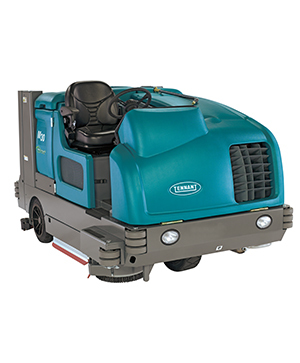 Tennant’s M20 Integrated Rider Scrubber-Sweeper can help reduce your cost of ownership with innovative technologies that clean harsh environments in a single pass. Tennant’s 8300 Battery-Powered Rider Sweeper-Scrubber cleans harsh industrial environments in just a single pass. Tennant’s M30 Integrated Rider Sweeper-Scrubber picks up large debris and provides powerful scrubbing for harsh environments in a single pass. For the deepest clean indoors or outdoors, you need a heavy duty piece of equipment that can take care of it all with ease and efficiency. Look no further than Goscor, where you can find an exclusive line of Tennant sweeper scrubber combination machines that will get the job done for you in just one pass. Tennant’s range of ride-on scrubber sweepers are designed to clean up the biggest, toughest, grimiest messes while you ride along without scrubbing a thing yourself. Use any of the models in the range to clean up large indoor or outdoor areas. With innovative technology and combined system format, these machines are guaranteed to lower the cost of ownership and improve productivity when compared with the effort and time needed to do the same job with two different machines. Goscor offers three different Tennant sweeper scrubbers to choose from. The M20 – 5680m2 provides maximum productivity, a lower total cost of ownership, and increased safety. The 8300 – 5080m2 sweeps and scrubs with maximum effort and less noise than any other sweeper scrubber. 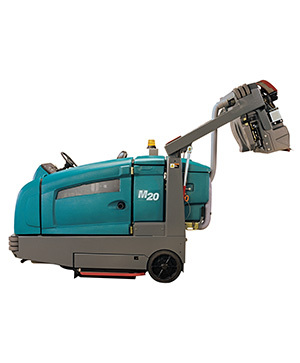 The M30 – 6100m2 provides superior results with just one run over the surface, using the patented FloorSmart cleaning system. 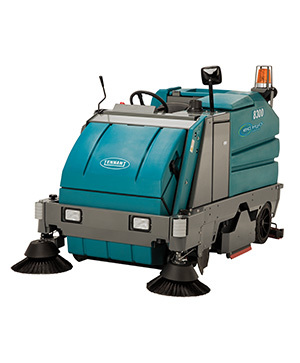 You can eliminate the complexity of traditional sweeper scrubbers with any of these innovative models by Tennant. Each model uses the ec-H2O chemical-free or FaST foam scrubbing technology, created and designed by Tennant to provide effective and environmentally-friendly cleaning solutions. For more than three decades, Goscor has been providing each of its customers with high-quality industrial equipment from some of the best names on the market. Their eco-friendly cleaning solutions, non-slip certified machines, and full range of genuine spare parts are backed by friendly and professional service. Each one of their technicians are factory trained and their service agents can understand the needs and expectations of every customer. Trust Goscor to deliver equipment that will last a lifetime.